What is the difference between a Barbados Blackbelly sheep and an American Blackbelly sheep? How do I know which breed of sheep I own? There is SO MUCH confusion on the Web about what sheep is called by what name. Here is the short answer: Barbados Blackbelly rams and ewes are polled (they have no horns). In contrast, American Blackbelly rams are horned and the ewes may or may not have horns. This simple decision tree may help you identify what breed of sheep you have. What are scurs? What are horn buds? A “scur” is a horny growth on the skin and not attached firmly to the skull. 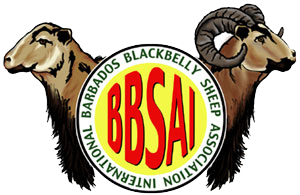 Scurs are tolerated when registering Barbados Blackbelly sheep. In contrast, “horn buds” are short, stumpy horns attached to the skull. Horn buds are not tolerated in Barbados Blackbelly sheep but are acceptable in American Blackbelly rams. My ram has 2-in. horns. Is he eligible for registration? If he is an adult ram with 2-in. horns (called “horn buds”), he is not registerable as either an American Blackbelly or a Barbados Blackbelly. If he is a young ram lamb with 2-in. horn buds, give his horns time to grow out. If they don’t, then he is not eligible for registration. The Breed Standards specify that American Blackbelly rams have a substantial rack of horns and that each horn be equal in size and shape. The standards specify that Barbados Blackbelly rams be polled. Therefore, 2-in. horn buds are neither this nor that, and a mature ram with these horn buds carries questionable genetics. What if I don’t know who the parents of my sheep are. Can I still register it? No. American Blackbelly and Barbados Blackbelly sheep can be registered only if both its sire and dam are registered. The BBSAI has written policies governing exceptions to this to ensure that sheep who can make a valuable contribution to the very narrow gene pool are not excluded and can be registered. Please refer to the breed standards on this Web site for both the American Blackbelly and the Barbados Blackbelly sheep breeds. What do the registration numbers mean? What is the breeder’s Flock Prefix? A Flock prefix is a unique 3-letter code that represents a breeder’s identity in a sheep’s registration number. When a person applies for BBSAI membership, he or she selects this 3-letter code and, after BBSAI approval, the code is then referenced on all BBSAI paperwork (membership certificates and sheep registrations). Why should I bother registering my sheep? Registering your sheep with the BBSAI documents its quality and that of all its offspring. Registering your sheep and keeping the paperwork current is the best way to establish validity of bloodlines and to trace the ancestry of your sheep. The registry helps potential buyers of your sheep identify suitable bloodlines and can contribute to increasing your sheep’s dollar value. What do I need to do to register my sheep? First, you must be a member in good standing of the BBSAI. After you verify that your animal meets the breed standards for either American Blackbelly or Barbados Blackbelly, you submit a Registration Application for each animal to be registered. The application must include a quality photo and the registration fee. If you are registering lambs whose parents were not owned by you when the lamb was conceived, then you also must fill out a Certificate of Parentage/Service. When approved, you will be issued a Certificate of Registry for your animal. The application can be obtained from the website or you can contact the BBSAI Registrar by email. How does the BBSAI determine if my sheep is eligible for registration? The BBSAI requires that the individual owner/breeder make the initial determination about whether or not a sheep is eligible for registration. The owner/breeder must carefully study the BBSAI breed standards for American Blackbelly or Barbados Blackbelly sheep. If the sheep meets the standards, or most of them, then the owner submits the application accompanied by a quality photo and registration fee. The BBSAI will then confirm that the standards have been met or reject the registration if the photo clearly indicates a lack of conformance to the breed standards. What’s the difference between “recording” a sheep and “registering” it? You would record a sheep when it has some conformation or congenital deficiency such as poor hind quarters, small ears, white spots, poorly proportioned horns, or no black belly. In contrast, you would register a sheep when it meets all of the breed standards. For example, if you have a lamb born of two registered parents but the lamb does not meet the breed standards, you would record it rather than register it. By providing the options for both recording and registering, breeders can work toward preserving the integrity of the breed, and good records can be kept on entire bloodlines. What do “recorded” numbers mean? Why should I pay to simply “record” my sheep if they are not eligible for registration? By “recording” your sheep with the BBSAI, you are helping to preserve the records of a specific bloodline. Recorded sheep are related to registered sheep, but do not meet the Breed Standards. However, they could produce a registerable animal in the future, and you can maintain the traceability of the bloodline by recording all breeding animals. Why should I join the BBSAI? The best way to support, improve, and promote these wonderful animals is to be part of an association that shares these goals. By working together, members are able to exchange information and ideas that are helpful in raising, preserving, and developing better markets for our breeds of sheep. The BBSAI currently has more than 100 members representing the United States, Canada, and Mexico. There are over 2000 sheep registered. How can I become a member of the BBSAI? You can download a membership application from this website or ask the BBSAI Secretary to mail an application to you. How do I qualify for consideration as a Director? You must own Barbados Blackbelly or American Blackbelly sheep while serving as a Director. You must have stock registered with the BBSAI. You must be willing to actively participate in Board meetings (held via email and teleconference) and to volunteer your time in promoting the BBSAI and the breeds it serves. You must also be an active participant in one or more BBSAI projects. How are the BBSAI officers elected? The BBSAI membership elects a slate of board members following its annual meeting election. Candidates for officers are selected from the current board of directors, and each officer is elected by majority vote of the board of directors. Please direct any questions you have to the current BBSAI president.